The AFL-CIO is the umbrella federation for U.S. unions, with 56 unions representing 12.5 million working men and women. The AFL-CIO works to ensure that all people who work receive the rewards of their work—decent paychecks and benefits, safe jobs, respect and fair treatment. They work to make the voices of working people heard in the White House, on Capitol Hill, in state capitals across the country and in corporate boardrooms. They provide an independent voice for working families and ways for working people to be actively engaged in politics and legislation. They also hold corporations accountable for their treatment of employees and ensure the voice of working people is heard in the financial system. They also work with federations of unions in other countries toward global social and economic fairness. "The American Federation of Labor and Congress of Industrial Organizations is an expression of the hopes and aspirations of the working people of America. The NorthEast Wisconsin Building & Construction Trades Council shall be dedicated to the improvement of wages and fringe benefit packages, which reduces employee turnover and sustains a quality family life; the advancement of apprenticeship, training, and journeyworker upgrade programs which benefit not only our members but also our contractors and their customers; securing a safe and healthy work environment so all construction workers can return safely to their families; to provide quality and value in every construction project to our contractors and their customers; and to build quality communities through individual and Council involvement in area school and community functions and activities which further advance the positive character of the Council. Throughout their history, the MBCTC members have built Milwaukee, and it's impossible to look at the skyline without seeing a Union-built project. Their membership has worked hard to build some of the city's greatest landmark structures. 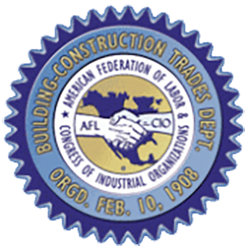 Originally chartered in 1910, the Milwaukee Building & Construction Trades Council, AFL-CIO (MBCTC) is still dedicated to the same set of core values and practices. Even in the infancy of the organization, they recognized the need to integrate themselves into the community and focus not only on "bread and butter" unionism, but to encompass a broad spectrum of economic and social objectives. 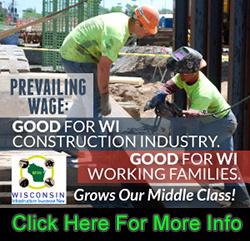 The Southern Wisconsin Building and Construction Trade Council seeks to strengthen state and regional economic competitiveness in the global marketplace by sharing trade development information, jointly promoting regional projects, and collectively advocating for the AFL-CIO programs and policies which will benefit the jurisdiction . 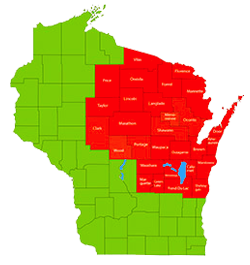 The SWBCTC is supported by Wisconsin State Councils and appropriations from its 7 county jurisdiction. Now, more than ever, Wisconsin's Building Trades Unions are providing solutions to meet the challenge of a changing, energy-conscious world. With pride, performance, and professionalism, their highly skilled work force delivers unmatched value for contractors and owners alike. With apprenticeship training programs that set the standard in the construction industry, the SWBCTC provides life-long career and advancement opportunities for those with the discipline and determination to have a direct impact on the future of Wisconsin. For those looking seeking employment into the construction trades in Southern Wisconsin, the SWBCTC offers the best wages, training, and safety so apprentices can personally feel rewarding. It is the best career path you will ever take. The Building Trades Council of South Central Wisconsin is decided to supplying professional, skilled and experienced manpower to contractors to suit their needs on a one-time or continuing basis. Each member of the Building Trades Council has served an apprenticeship to learn their trade on the job under the supervision of a master tradesman. Training is inclusive and covers every level of the trade so a thorough understanding of the entire process is gained. In addition to providing our union members with valuable training and confidence in all aspects of their trade and the competence to work safely they also receive a family supporting wage, health insurance benefits and a pension. By working together our members and contractors produce safe building projects that come in on time and are cost effective. Building Trades Council of South Central Wisconsin is proud to offer apprenticeships in all trades and constructions projects including; residential, commercial and industry. We highly encourage women and minorities to apply. The Building and Construction Trades Council of South Central Wisconsin is a labor organization representing 19 individual Union Locals, comprised of 17 different construction crafts.Our affiliated unions represent members who are involved with almost all aspects of building and construction. Their council is affiliated with the Building and Construction Trades Department of the AFL-CIO. Union Building Tradesmen and Tradeswomen have a proven track record in cost effectiveness, safety, high quality, and timely completion of building projects. Their trades people work with pride to serve the community and uphold the tradition of American building excellence.